Tooth loss is a highly prevalent dental and oral health problem today. Although having missing teeth naturally comes with ageing, a lot of cases are due to accidents that happen in sports, at work, and even at home, or it could be a result of the lack of proper oral hygiene. Before things get worse, it is important to consult your trusted partners here at West End Denture Clinic so that you can be provided with top-notch solutions for missing teeth, like these quality Full Dentures. More commonly known as false teeth, dentures are prosthetic appliances supported by surrounding tissues of your oral cavity to replace teeth which you have already lost. They have been used to address the problem brought about by missing teeth since around 700BC. Today, with the advent of more modern tools and materials, dentures now come with different designs depending on your preference and suitability. Yet, the purpose remains the same. Dentures are made to bring back the beauty and function of your smile to perfection. During your initial consultation, your reliable dental prosthetist will examine your teeth and gums so as to assess which type of denture is recommended for you. 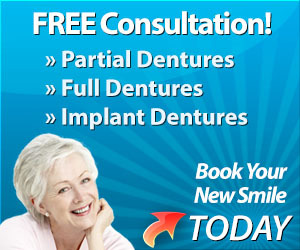 Then, we will discuss the options that you have so that you can make a well-informed decision regarding your dentures. Getting dentures usually take 2 to 4 visits to our clinic. At the first appointment, impressions of your teeth will be taken and sent to the dental laboratory so as to produce a custom tray. Next, a more accurate mould of your bite will be set in wax using the custom tray and a temporary denture will be tried on. Finally, your dentures will be fitted on your next visit. Comfort and fit will be evaluated and your dental prosthetist will provide you with tips on taking care of your dentures. Putting up with the consequences of tooth loss and missing teeth can be very troublesome, and we at West End Denture Clinic do not want you to experience this burden. For state-of-the-art solutions for your missing teeth, consult your trusted dental prosthetist here at West End Denture Clinic. We can help you gain back your smile, your confidence, and everything that you have lost due to tooth loss by providing you with our top-notch dentures. Call us today on (07) 3844 0944 or simply book your appointment online.